The Odyssey is now surveying new territory in the Solomon Sea. As we depart Madang harbor, the faint but familiar sound of pilot whales drift into the pilothouse through the array speakers. 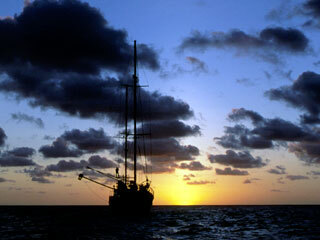 We are heading south toward Vitiaz Strait and into the waters of the Solomon Sea. This next research leg will take us into an area of the Solomon Sea we have yet to survey. We will sail along the south coast of New Britain. The chart shows bathymetric features we have learned are often associated with large numbers of squid and hopefully sperm whales. The region we are heading for has severe drop-offs, ranging in depth from 4,000 to 8,000m; these are some of the deepest waters on earth. We have been told by local fisherman that not only sperm whales, but minke whales, orcas and whale sharks also frequent this area. The crew is looking forward to another exhilarating experience at sea, at the mercy of the unexpected. We are fortunate to be joined by Rodrigo Olson who is currently captaining the Odyssey. Rodrigo has come from a background that has combined Oceanography, specifically the study of coastal ecology, with many years at sea as a boat Captain. This has included working on a documentary film about the Gray whales of Scammon's Bay in Baha California. He spent three and a half years sailing the waters of the Pacific filming cetacean behavior. In addition, he has worked as a diving instructor, focusing on scientific research and field study. Also joining us is Joe Cavanaugh from the Marine Biology Laboratory based at the Woods Hole Oceanographic Institute. Joe will be working on board the Odyssey for the next couple of months as the Scientific Manager. He is a conservation biologist with an interest in genetics. His Research Masters involved assessing the reproductive fitness in squid, by observing and recording alternate mating patterns. 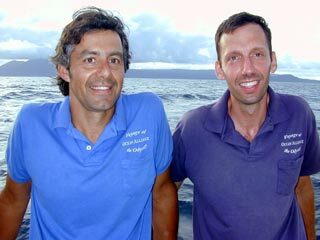 Rodrigo Olson (left) and Joe Cavanaugh. Having Joe on board Odyssey is particularly exciting, as squid are the predominant prey species of the sperm whale. The sperm whale is the focus of our three-year global study and there is much we do not know about the lives of these animals, including many aspects of their foraging behavior. Perhaps Joe's time here will assist us in discovering more about the little known predator, prey relationship between these two animals, in addition to allowing us an insight into the fascinating world of the squid.